A3 – The basic Problem Solving Tool. 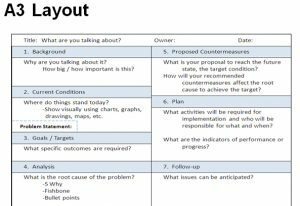 The A3 problem solving methodology can be used to solve any problem or non value-added issue that needs to be addressed by any department e.g. Finance, HR, Engineering, Customer Services, Purchasing, Manufacturing etc. It captures the main elements of an issue or project on a single A3 sheet. The Problem statement – what is the pain being caused for the organization? The Gap – The distance from here to where you want to be. The Countermeasures – What will you do to remove the root causes. Takumi precision engineering is a leading precision component manufacturing partner with the ability to develop products from concept, through prototyping and onto the full production run. We supply, and work on behalf of, companies in the medical devices, pharmaceutical, aerospace and precision engineering arenas. Our clients are based world wide and demand the very highest levels of quality and service.